The Washington Capitals have acquired forward Casey Wellman from Florida in exchange for center Zach Hamill, vice president and general manager George McPhee announced today. Wellman, 25, has recorded 23 points (seven goals, 16 assists) in 37 games this season with San Antonio of the American Hockey League (AHL). He ranked third in points on San Antonio at the time of the trade. The Brentwood, Calif., native has tallied 13 points (four goals, nine assists) in 41 NHL games with Minnesota from 2009-2012, and has recorded 105 points (44 goals, 61 assists) in 136 career AHL games with Houston, Connecticut and San Antonio. The 6’0”, 185-pound forward was originally signed as an undrafted free agent by Minnesota in March 2010. He spent two seasons at the University of Massachusetts (Amherst) and compiled 78 points (34 goals, 44 assists) in 75 games and was named to the NCAA Hockey East All-Rookie Team in 2009 and the Hockey East All-Academic Team in 2010. Hamill has registered 22 points (11 goals, 11 assists) in 40 games this season with Hershey (AHL). Second, the Bears acquired forward Peter LeBlanc from the Chicago Blackhawks in exchange for forward Mathieu Beaudoin. From bad, to ugly, to scary, the Washington Capitals are falling down a hole in only the third game of the season. Panic buttons sought after and pushed. The woes continue for the boys in red as they are manhandled in their third game in a row by the Montreal Canadiens 4-1. Joey Crabb scored the lone Capitals goal. It came at just over two and half minutes play in the third period to break up Carey Price's shut-out. The Capitals are off to their worst start since the '93-'94 season. If you are looking for silver linings, the dark clouds seem to be growing at a rate to over look the bright spot. While it is not the end of the world, there does need to see some sort of improvement. Just some quick points on the Caps loss. Michal Neuvirth looked good through the first period. You can't really blame him for the four goals given up tonight, much like you could not fault Braden Holtby in the previous two games. The Capitals' PK is terrible. There is just no nice way of saying it. And it's simple mistakes that are leading to goals with a man down. Defenders turning their back on plays, making the wrong read on plays developing in front of them. Making those corrections just comes with time, a luxury the Caps do not have. The Capitals' PP fares no better. The Caps were 0-4 tonight and what ever play they could muster, the shots seemed to be snuffed by a sprawling defender or Price was able to make the easy save. Lack of movement seems apparent on the new power play system. Mathieu Perreault complained about his ice time, so coach Adam Oates gave him more time. Matty P seemed to add a spark through the night and at times had a few good looks at the net. That is a player rewarding his coach for giving him more ice time. If you are looking for heart, Matt Hendricks has an Aorta the size of the Washington Monument. He fights, he hits, and he has scored. Hendricks might not have been on the scoring end tonight, but his hard work, tenacity and overall hockey sense makes him, thus far, this team's MVP. Adam Oates said it. The Capitals are a "fragile" team right now. It showed. After the 5 on 3 goal and the following Habs PP goal, the Caps just looked beat. Body language spoke volumes following Montreal's two goal lead. Hanging heads, team mates not speaking on the bench, it looked as ugly as it was. The line juggling in this game reeked of desperation on the behalf of the Caps' coaching staff. Alex Ovechkin started on the right wing, but moved back to his familiar left wing spot. Not that any of that juggling helped much. Ovi's move back to left wing was done in the hopes to get him going. No time to dwell, Caps face Devils tomorrow night at "The Rock". The Capitals are the only team in the Eastern Conference with out a standings point. Both Carolina and Philadelphia were the last hold outs, and both won their games tonight. If the LA Kings win or tie tonight, the Capitals will be the only team in the NHL with out points. Setting the bar high. The tandem of Carl Alzner and John Carlson was broken up for the third period, at the mention of breaking the pair up by Alzner to the coaching staff between periods. The coaching staff obliged and Alzner played with Hamrlik to start the third. The Habs broke a 6 game losing streak against the Capitals with their win tonight. NHL finally has returned to Washington DC's Chinatown. It is too bad the Capitals did not show up for the occasion. The growing pains of a new system seams to much to handle for the Capitals and the shortened season is making the urgency to correct mistakes has upped to critical. Caps drop their home opener and have yet to win a game to the Winnipeg Jets 4-2. Matt Hendricks finished off a brilliant tic-tac-oops play. Alex Ovechkin found Nick Backstrom who quick passed it to a waiting Hendricks in front of the net. The pass from Backstrom hit Hendricks in the skate then off what looked like his shin and stick to plop in behind Ondrej Pavelec. It gave the Caps the early lead and a good start. Troy Brouwer got on the scoresheet late as the Jets took a late penalty. The power play finally nets a point for the Capitals, but too little too late. Winnipeg took advantage of two early power play goals, coupled with a few lucky bounces and scored 4 straight goals to put the Caps on ice. What ever fight was left in the Capitals left with the early sold out crowd that looked for exits half way through the third period. There was no sustained attack by the Capitals whether it was power play or 5 on 5, it was a team just standing around. The Capitals were thoroughly man-handled in the second period giving up a pair of goals on twenty shots by the Jets. In fact through the first two periods, the Capitals were out shot 33-17. Winnipeg peppered shots on Holtby and the lucky bounces went their way as they took a 4-1 lead into the second intermission. If you are looking for some positives, look no further than Hendricks. He scored the first goal of the game, then as the team deteriorated he picks a fight with Jim Slater at the end of the second period and danced with Chris Thorburn in the third period. Hendy has been so far the bright spot for the Caps in these last two games. His hard work ethic and ability to be a spark offensively or defensively has been a plus. The Capitals power play certainly needs some more work. While it showed signs of promise tonight, the overall effect is not one of pressure or gaining momentum. It more played out as a measured attempt at a system newly taught. The Caps are certainly feeling every bump in the road as they assimilate to this new season. Oh that penalty kill came back to haunt the Capitals again. The Jets were right off the bat 2 for 2 in their power plays in the first period. It forced the Caps to play a more conservative brand of hockey for fear of getting penalized. The Jets from there controlled the pace and the physicality that the Caps just could not match as the game wore on. Braden Holtby did his part. Often left in the cold by his "stand around and watch" defense, Holtby did make a few great saves that later translated to opportunities on the other end. But the Caps just couldn't play cohesively enough in front of him. Unlucky bounces and some sloppy defense made it another rough night for the Capitals net minder. Just as in the Tampa game, the Capitals did not look very sharp. Miscommunication, bad passes and sloppy zone play came to haunt them. And instead of seeing any kind of fight from the boys in red, there was a slow passiveness that was uncharacteristic of the team's past. They lost puck battles on the boards, made simple mistakes, were caught standing around and were beaten to loose pucks. In time these things can be tightened up, tweaked and revamped. But time is a luxury the Caps can not afford. They now have let four points go in their division to their rivals. Is there time to right the ship, of course. But the way this team is playing, the short season might be a mercy blessing in disguise. Brooks Laich may return to practice with the team as early as tomorrow. But the coaching staff doesn't want to rush the injured forward back into the line up. Laich injured his groin playing overseas. Mike Ribeiro was the recipient of a couple of missed high sticking calls off face offs and on the PK. Ribeiro kept on the officials until he was finally penalized a two minute minor and a 10 minute misconduct for unsportsmanlike conduct. Like lemon juice in a paper cut. Head coach Adam Oates blamed the lack of energy from poor conditioning. "They didn't have much in the tank." I see sweating to the oldies in the Caps near future. Okay, let us go through the list of excuses. It is a new system. There was really no time to effectively implement said system. It is a work in progress. But a loss is a loss. The Washington Capitals failed to take two points from a divisional rival as the Lightning down the Caps in their season opener 6-3. "I think some of the mistakes came from conditioning," said head coach Adam Oates of the loss. "We got tired at times, the game went in waves. I think some of the penalties in the third period, you can't really give them a five-on-three to start the third period. That obviously hurt us." The Capitals got off to a good enough start. Two power plays right off the hop as Ryan Malone and Brian Lee took early penalties. But the Lightning would strike first with a point shot from Eric Brewer that beat Braden Holtby. Joel Ward would even the score with a late power play goal, but it didn't take long for the Lightning to regain the lead. A complete break down in the defensive zone lead to a Vincent Lacavalier goal passed a sprawling Holtby. Ward would answer the call again as a quick rush up the ice with John Carlson led to a Bolts' delayed penalty. Not quitting on the play, Ward crashed the net and the puck ended up past the giant Anders Lindback to tie the game up at 2 a piece. That is when Tampa's power play woke up. They would once again retain the lead when Marty St. Louis stuffed a back door pass from Lecavalier. As the Capitals landed in penalty trouble down the stretch, a four on four goal where new comers Mike Ribeiro fed a nice pass to Wotjek Wolski for his first goal as a Capital. It would tie the game up going into the second intermission. But the third period did not fare well for the Caps' penalty kill. They allowed two more power play goals by the lightning and a bad break down by the Capitals defense made it a rough night. Conditioning was also a contributing factor according to Oates as the Caps seemed to lose steam as the game wore on. "A lot of little mistakes, to be expected," Said Oates of his impression of the game. "And a little bit of conditioning; we got a little tired at times." 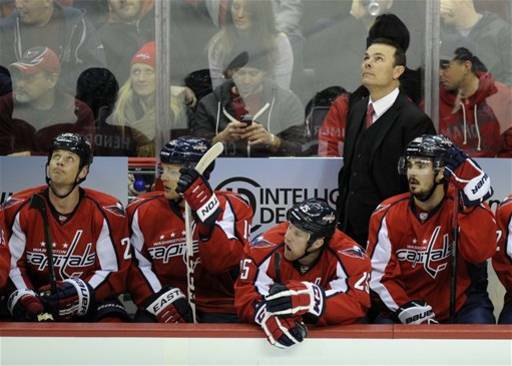 As predicted by Oates, the Capitals were sloppy and disheveled in his coaching debut. The Caps learning a new system on the fly cost them points early on, but as more games are played how this team will do under the new system will better take form. "It's tough," Oates said of his team's chemistry. "It's going to take the guys a while. And we've talked about that, and hopefully we can win enough games until it becomes automatic. Tonight wasn't our night, but there's a lot of positives in the game and we'll talk about that on Monday." The Capitals' power play could have capitalized early with the chances the Lightning gave them. Double that missed opportunities with the number of penalties the Caps took from lazy stick work, and the Caps were looking at a rough night with a potent power play facing them. The penalty kill was less than stellar, but give the Lightning as many opportunities as the Caps did with soft penalties bad things will happen. There are no do overs for the Capitals, they are playing for points now. The learning curve will have to be quick. They have two days before the home opener Tuesday night. It should be enough time for the coaches to put video in front of the Caps and work out the kinks. Jack Hillen was injured when he was taken out by Lacavalier who was not penalized for the hit. He did not return after the hit. Tom Poti made his official return to the ice as a Cap. After missing almost two years, the veteran defenseman did not see a lot of ice time, but did get an assist on Ward's first goal. Matt Hendricks and Troy Brouwer were the only centers over 50% on draws (Hendy 6-6 100%, Brouwer 6 -10 60%). Just about 4 months of missed NHL action and it is finally here. A NHL season. It may only be 48 games, but it is better than sitting out for four months rather than 12, or longer. And tonight is the night. 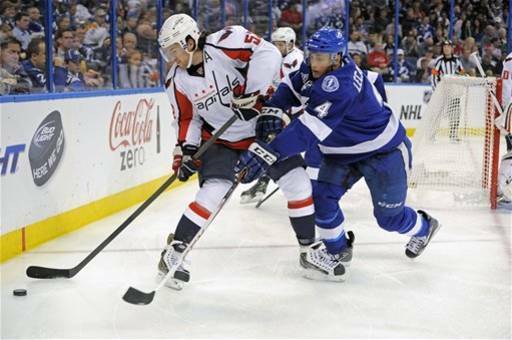 The Washington Capitals will start on the road taking on the Tampa Bay Lightning. Hockey is back in DC. I had to go back and look at my season's previews that I saved, only to realize I did not save them. Bummer. And since everything seems to happen last minute, why don't we condense a season preview of the 2013 season for the Capitals. I will throw in some interesting tidbits and what ever is left over, I will find a link for you to follow. Deal? The lockout accomplished one thing, it will be a sprint to the playoffs. With only 48 games on the docket, teams will have to push to keep up with points early and often. The Caps are no different, and in a division where it seemed everyone got some talent it is going to be important to take a few points from your own division. There is good news however, the Capitals will make a return to some aggressive offensive play. Adam Oates' new system will allow for the Caps to use an aggressive forecheck and let the defensemen jump in the play when the conditions warrant it. It is a system that seems to be more in tune with the personnel the Caps have this year. Unlike Hunter's defense first philosophy, the Caps will have some opportunity to attack in the offensive zone. You probably have heard a 1-3-1 being tossed around on the blogs about the Capitals new power play system. Like Japer's Rink, Dump 'n Chase and Peerless to name a few. Until we see it in action, there doesn't seem to be a way to gauge if it will work or not. For the Capitals, their system under Bruce Boudreau depended heavily on the power play. It allowed the team open space 5 on 5 and they took full advantage of teams not wanting to in any way take a penalty. But when the power play faltered so too did the offensive production at even strength. Teams found away to better defend the Caps potent offensive strife as well as played much tighter on snipers like Alex Semin and Alex Ovechkin with out worry that if they took a penalty, their team could kill it off. Oates' system will depend on the power play somewhat, but he also wants his players to make better reads. A thinking offensive player is better than a head first into the zone then work it out approach makes better sense with the players Oates has to work with. Capitals sort of revamped the back end defensively speaking. Calle Johansson, assistant coach and former Caps D-man, has the boys getting the puck out of the zone quickly. The faster the puck is out, the more on the heels the Caps can have their opponents in transition. This requires a lot of work for the defensmen and the center who have to find outlets for the puck. Passes out of the zone to wingers or dumps off the glass, the Capitals will be looking to getting the puck out of their zone as quickly as possible. Now that strategy could change game to game, but the overall scheme the Caps want is a quick transition game. How that will work with Tampa's infamous 1-3-1 trap, we will find out tonight. Braden Holtby might get the start in net tonight against the Bolts. But the way Oates is going to be handling his goaltenders, there really isn't a number one or number two. "In my mind I think both guys are going to play a lot," Oates said of his goaltending pair. "There is going to be a lot of back to backs, it is going to be a different schedule, so I'd imagine both guys would get a lot of hockey." Michal Neuvirth and Holtby will be tag teaming a lot of games. Especially the seven back to back games on this schedule. Riding the hot hand may be tough to do during the season, but the playoffs are another beast all together. So we will leave that beast for later. Both goaltenders won't be taking any ego hits because of the way Oates plans to use the tandem. Both seem ready to accept their roles together. "The one thing that is certain," Holtby said, "is that we will both be needed and be needed to win games in order to make the playoffs and put ourselves in a good position." It seemed like an unlikely return. Most of us had written him off. In fact you would have to go back nearly a year and a half for in this blog to even see his name mention (with out bringing up the salary cap). Tom Poti may make his long awaited return to the ice for the Washington Capitals tonight. It would mark an outstanding return for a player that has not seen NHL action in nearly two years. You can read about his amazing journey back to the Capitals on Mike Vogel's Dump 'N Chase. Short story was Poti thought he just had a recurring groin injury, turned out to be a fractured pelvis. He keeps in shape, works out a plan to return, spent some time in Hershey (2 games) and has made the opening night roster. Uh, Bill Masterton trophy anyone? All aspects of their offensive numbers, 5 on 5, power play, shoot out, empty net, needs to improve over this 48 game schedule. If the Capitals want to return to the playoffs and make it deep once they get there, some key points will need to be addressed for it to happen. The overall census though is for the Capitals to return to being an offensive power house. What was once praised for their creative, explosive and consistent goal scoring prowess, needs to make a return for the Capitals to do well. Ovechkin numbers need to improve, and Oates seems to have a plan for that. He has moved him to the right wing to open the wingers vision to more of the ice. Ovi, a right handed shot, had been playing left wing. Normally a scorer of his magnitude, being a right handed shot on the left side makes it easier for one to cut into the center of the ice and have your shot on the forehand. By moving him on the opposite side, Ovi will have better protection of the puck and a quicker release with out having to pull the puck back to his forehand side. Got it? While we talk of offensive numbers improving, the team overall has to play with much better cohesion. That does not just mean chemistry through the lines, but also how the team moves as a unit transitioning from offense to defense and back again. Wingers have to get back, centermen have to cover defensemen on the defensive side, while the green light is given to defensemen to jump up in the play, creating odd man situations and more open reads for wingers looking to pass to open players. Mike Ribeiro will play an important role in that second line setup to complete the one two punch. The second line has to support the top line with goals as well, something that has been thus far inconsistent for the Capitals. A crafty centerman, his talents will also be helpful on the Caps' power play. Wojtek Wolski should add some stability to that second line as well. He will also bring some pizzazz to the shootout, an important part of the new NHL and important for the Caps in this shortened season to grab points where they can. This is actually a very exciting time for the Washington Capitals. New coach, new system, new players infused with the old standards will make for an interesting season. Can it translate to wins? 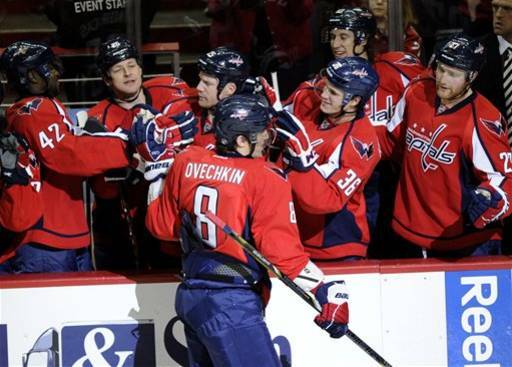 Can the Capitals finally make some headway in the playoffs? All of those questions will be answered staring with game one tonight against Tampa. As hockey pundits put it, we won't know until we play the games. But no one, not even the coaching staff, is going to think a Stanley Cup is anywhere in the Caps near future. Oates admitting himself the first game of the season will be a sloppy mess. That is to be expected coming out of the blocks this way. Players playing to their potential, should give Caps fans something to cheer and look forward to. After all, we waiting four months for this. Now it is here. NHL hockey is back. Brooks Laich was not on the starting roster and was not listed on the IR. He can be activated at any time. Whether he will face suspension from getting hurt is still up in the air. Wash Times has the latest. The Capitals are set with their roster, two goaltenders, 8 defensmen and 13 forwards. Joey Crabb made the team as well as Tom Poti. If Laich does return, it will be interesting what the Caps do with either of those two players. Owner Ted Leonsis said he never made a dime of profit while owning the Caps. What the new CBA does for Uncle Ted by WaTi here, and the new dynamic of relationship with the players post lock out from the WaPo here. Braden Holtby and Michal Neuvirth sharing duties. One week training camp, zero preseason games and a forty-eight game schedule makes for a tough challenge for any team to have a successful season and make the playoffs. Of the key factors teams will face this shortened season will be the net minders. With the many schedules that are cramped into this 48 game span, a large number of teams will be faced with 7 to 8 back to back games. It will be key for the back up goaltender to steal a few points here and there for his team. Rather than looking at it as a number one and number two, the Washington Capitals seem content to share the duties of goaltender on their young talents Braden Holtby and Michal Neuvirth. Both have been capable number one goaltenders for the Capitals in the past. This season, the Caps have seven back to back night games and head coach Adam Oates seems ready to have the goaltending duties shared by both net minders. "The way the season is going to come it is going to call for both of us to be playing well," Holtby said of the shared duties the tandem will see this season. "I have no idea if there will be a number one or a number two." The sentiment of both goaltenders being used seems to be radiating around the league. Teams might have an advantage if they can get their goaltending duties split and get consistent results doing that, especially if their back up can steal a game or two in that capacity. It has even lead to some early strategy by teams like the Pittsburgh Penguins who plan on having their tandem work for them in special circumstances. A good one two goalie punch can be looked upon as an advantage over other teams that might tend to lean on just one goaltender as they have in the past. Although some have suggested that since it is a shortened season, maybe teams will want to favor their number one goaltender. "I don't think anybody has a perfect formula," Oates said of the teams' strategies going into a shortened, condensed season. "Everyone is going to try and create one and we're no different. We are going to try to think of everything we can to try to make it right and make sure the guys play their best in a short amount of time." Points will be at a premium and it is in the best interest for teams around the league to take a point or two with their back up goaltender in net. That would make the tandem of a team's goaltending unit seem more important with this schedule. "The one thing that is certain," Holtby added, "is that we will both be needed and be needed to win games in order to make the playoffs and put ourselves in a good position." The Washington Capitals weren't afforded a preseason game. They would have to make do with an affiliate team from Reading Pennsylvania to bus in for a little scrimmage. The Reading Royals bused it to town to give the Caps and their coaching crew a chance to look at just what they have. Things started off slow enough. Head coach Adam Oates thought as much as many of his players are not in game shape with the season opener in just 4 days away. It started slow for the Caps, but it would be a collision that would wake them open half way through the first period. Alex Ovechkin plowed into Marcus Johansson and it looked as if both players were seriously hurt and laid on the ice for a few heart stopping moments. "I think that woke everyone up," said Oates. "I guess we better pay attention." Ovechkin was cut on the chin from what looked like Johansson's helmet. Both returned to the ice shortly afterward. For the coaching staff, the scrimmage offered them a chance to use the system with their personnel the Caps have. "We filmed the whole game so tomorrow we can show the guys the reads," Oates said of the purpose of the scrimmage. "It's so much different when you can see yourself and your linemates." 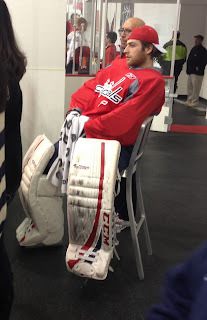 "It's good for our team as a whole," Braden Holtby said of the scrimmage. "It gives us a chance to watch video of ourselves doing what Adam [Oates] is trying to apply here." Getting Oates' system down was more of a priority for the Capitals than any evaluating players or even making sure the puck is in the back of the net. That competitive pace was helpful for both coaches and players get a better idea of how to see Oates' system. 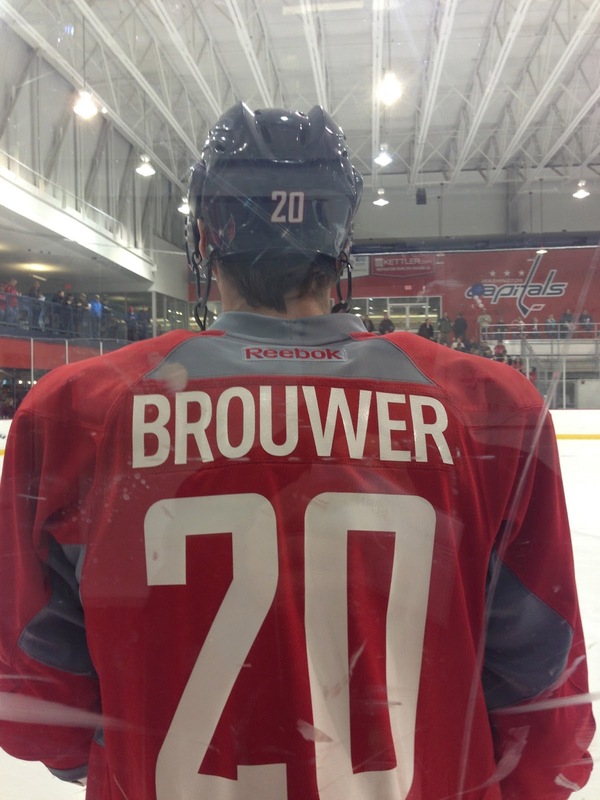 The Capitals won the scrimmage 8-0 and below are just a few thoughts of the scrimmage in general. Mike Green sat this one out. PR staff said it was due to a cold and the coaching staff said he was not going to lace 'em up for this anyway. The overall action started slow, but picked up especially after the Ovi/MJ90 hit. Both teams were told to lighten up on hitting, but the Royals did play physical with the Caps. Hillen got popped late in the first period and drew blood, but didn't miss any significant ice time. Ovechkin had a goal and two assists. Both him and Nick Backstrom looked pretty good. 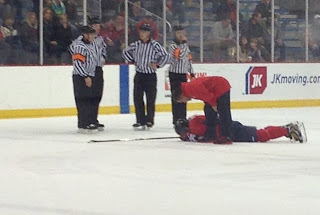 Backstrom was getting into board scrums and didn't look at all affected by any injury nor did he shy away from any hit. The talent level from the NHL to the ECHL is leaps and bounds. Often the Royals were left standing around in awe of the quickness and precision of the Caps with the puck. Oates certainly doesn't mind the defensemen jumping up on the play. On several occasions the D-men stepped up in to the play, John Carlson had a goal by doing just that. Braden Holtby and Michal Neuvirth shared duties and both allowed 4 goals against each. When Holtby was asked if both it was the goaltenders plan to give up 4 each he chuckled, "I don't think either of us wanted to do that," he said. Some pics I took, enjoy..
Nick Backstrom gives Ovi a look as if to say, "You ready?" With only 48 games to play this season, it's going to be a time crunch for any coaching staff to scout another team's system. For the Capitals, that could give them the element of surprise. 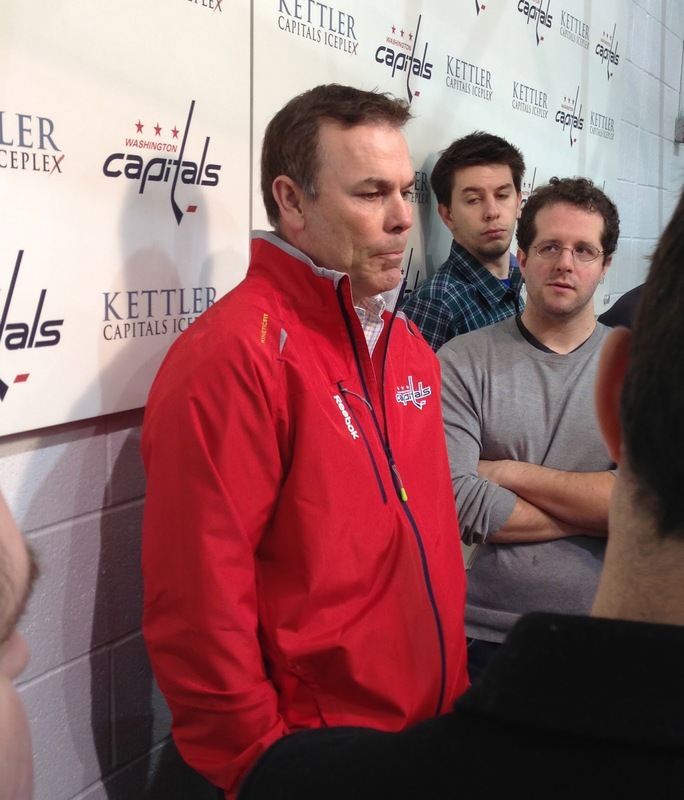 Head coach Adam Oates will have only a week to implement his system to his group of players. But as far as opposing teams scouting that system, it could take them 10 to 15 games to recognize it and to play effectively against Oates' system. In a shortened season such as this one, those first few games could be key for the Caps to find success. A couple of factors go into the surprise element for the Capitals. The first will be Oates has never been a head coach in the NHL. While he probably has had say in how the New Jersey Devils played in some areas, Pete DeBoer was the head coach and had final say in what went on the ice. That leaves the elements that Oates would have like to implement if he were head coach. If opposing teams want to study the tape of the Devils to gauge how the Capitals might look this season will have to concede that it's DeBoer's system and not Oates'. Along those same lines, if the opposing teams want to study tape of how the Devil's power play preformed under Oates' supervision they won't see Alex Ovechkin, Mike Green or Nick Backstrom on that tape. With a different personnel group (and a much better talented one in my opinion) infused in that same system, there are going to be differences. From who sets up the play to who shoots the open shot, the Caps' system under Oates will look strikingly different. Most, not all, teams in the NHL when faced with a new system often fall back and play that team conservatively. With some teams dropping back to play the Caps defensively minded, the boys in red, white and blue might be able to steal a few extra games early. That is key to setting up for a run to the playoffs with only 48 games on the schedule. It was more for the benefit of the media than it was for the general manager George McPhee and head coach Adam Oates to address the press. The "oh so fluffy" feelings of a hockey season returning saw both media moguls and Capitals' players and staff wearing wide smiles and patting each other on the back in a hearty "Welcome back!" Ovi walks in all smiles. Alex Ovechkin was the marquee guy that the press had asked for since seeing his return at Dulles Airport being greeted by Mike Vogel. 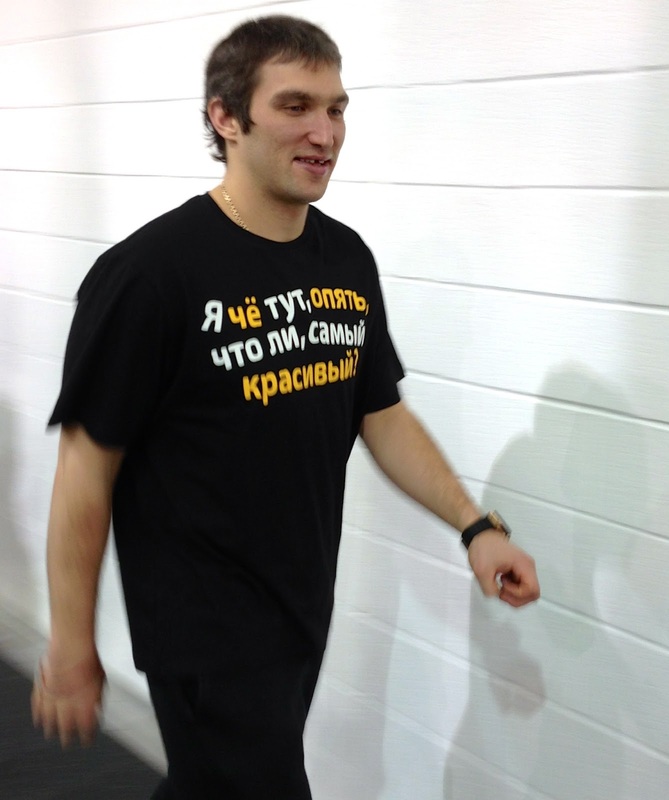 It looked like that was not going to happen, but in the end, classic Ovechkin strolls out, wide grin wearing a t-shirt that said in Russian "Am I really the prettiest one here, again?" To a Caps fan, yes, yes he was. From Braden Holtby, to McPhee, to Oates and then Ovi finishing up the impromptu media day at Kettler, the mood was light, cheerful even. A sense of relief was on the faces of both players and coaches and the people that interview them. Even a spotting of Joe Beninati, who regaled his rough time finding work during the stoppage with fellow reporters, made it seem that hockey was right where it was supposed to be in DC. While it is all smiles and cheerfulness, the seriousness of a sprint of a 48 game season is weighing on management and coaches. Anxious to get back to work, Oates told reporters of running line combos almost daily. Even McPhee is getting calls from other GMs around the league looking to trade once the CBA is ratified. It looks to be a confusing and fast start to the season, and the team most ready for it might be the one fighting for a chance in the Finals for Lord Stanley's Cup. So the smiles are fine for now. The real work begins when "camp" starts most likely on Sunday.